We’ve discussed the concept of pressure in the previous lecture, introduced units of pressure (Newtons per square meter, or Pascals, and the more familiar pounds per square inch) and noted that a fluid in a container exerts pressure on all the walls, vertical as well as horizontal — if a bit of wall is removed, the fluid will squirt out. Everyone knows that although water (like other liquids) is pretty much incompressible, air is compressible — you can squeeze a small balloon to a noticeably smaller volume with your hands, and you can push in a bicycle pump to some extent even if you block the end so no air escapes. . Boyle was the first person to make a quantitative measurement of how the volume of a fixed amount of air went down as the pressure increased. 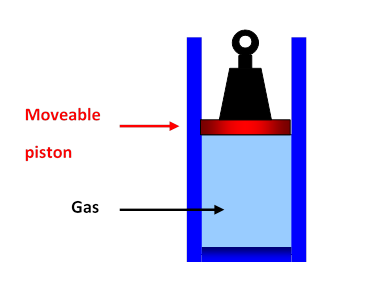 One might imagine doing the experiment with gas in a cylinder as in the diagram here, putting on different weights and measuring the volume of the gas. Once the piston is at rest, the pressure of the gas multiplied by the area of the piston would just balance the weight of the piston plus the added weight, so the pressure is easy to find. But there is one tricky point here: if the gas is compressed fairly rapidly — such as by adding a substantial weight, so the piston goes down suddenly — the gas heats up. Then, as the heat escapes gradually through the walls of the cylinder, the gas gradually settles into an even smaller volume. Boyle’s idea was to find out how the volume of the gas varied with outside pressure if the temperature of the gas stayed the same. So, if he’d done his experiment with the cylinder pictured above, he would have had to wait quite a time between volume measurements to be sure the gas was back to room temperature. But Boyle didn’t use a piston and cylinder. He did the experiment in 1662. Possibly the gun barrels manufactured at the time would have worked, with a greasy piston (I’m not sure) but he found a very elegant alternative: he trapped the air using mercury in a closed glass tube, and varied the pressure as explained below (in his own words). He found a simple result: if the pressure was doubled, at constant temperature, the gas shrank to half its previous volume. If the pressure was tripled, it went to one-third the original volume, and so on. That is, for pressure P and volume V, at constant temperature T, PV = constant. This is Boyle’s Law. After reviewing Boyle’s ingenious experiment, we shall see how Boyle’s Law is the key to understanding a central feature of the earth’s atmosphere: just how the density and pressure of air decreases with altitude. Of course, the temperature of the atmosphere also varies with height and weather, complicating the picture, but Boyle’s law gives us a very good start in analyzing the situation. Robert Boyle was born on 1627, the fourteenth child of the Earl of Cork, an Irish landowner. 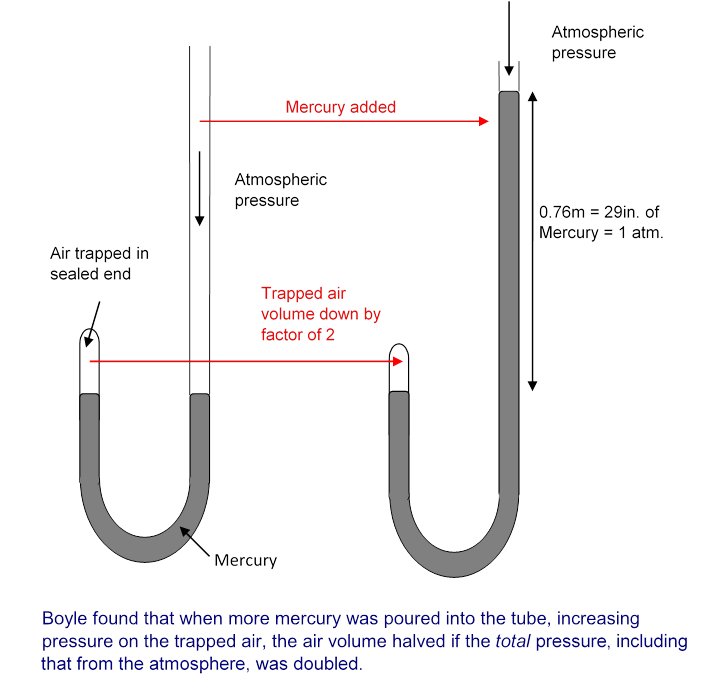 Boyle’s “delight and satisfaction” in that last sentence arose because he knew that the extra pressure exerted by the added twenty-nine inches of mercury was equal to an extra atmosphere, so the air trapped in the shorter tube had halved in volume when the pressure was doubled. He went on the repeat the experiment many times, with different heights of the column of mercury in the longer tube, and checking each day on the actual atmospheric pressure at the time of the experiment. for the range of pressures he used. It is important to note that in his experiments he allowed a long enough time between volume measurements for the trapped air to get back to room temperature. The pressure forces from the surrounding water acting on the curved sides obviously all cancel each other. So the only forces that count are the weight of the cylinder of water, and the pressure forces on the top and the bottom — that on the bottom being greater, since it must balance the pressure on the top plus the weight, since the cylinder is at rest. 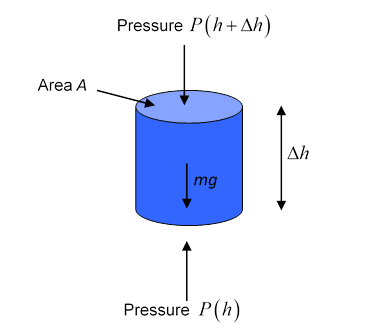 Taking the cylinder to have cross-section area A, height Δh, and the water to have density ρ, the cylinder has volume AΔh, mass ρAΔh, and therefore weight ρAΔhg. The pressure P is a function of height h above the bottom, P=P( h ). We’ve measured h here from the bottom of the ocean, because in the next section, we’ll apply the same analysis to the atmosphere, where we do live at the bottom of the “sea”. P( h+Δh )A−P( h )A+ρAΔhg=0. .
P( h+Δh )−P( h ) Δh =−ρg. But it doesn’t have the same solution! The reason is that ρ, which we took to be constant for water (an excellent approximation), is obviously not constant for air. It is well known that the air thins out with increasing altitude. The key to solving this equation is Boyle’s Law: for a given quantity of gas, it has the form PV=const., but notice that means that if the pressure of the gas is doubled, the gas is compressed into half the space, so its density is also doubled. dP( h )/dh=−CP( h )g.
P( h )= P 0 e −Cgh . The air density decreases exponentially with height: this equation is the Law of Atmospheres. This density decrease doesn’t happen with water because water is practically incompressible. One analogy is to imagine the water to be like a tower of bricks, one on top of the other, and the air a tower of brick-shaped sponges, so the sponges at the bottom are squashed into much greater density — but this isn’t quite accurate, because at the top of the atmosphere, the air gets thinner and thinner without limit, unlike the sponges. The equation is the same as df( x ) dx =af( x ), where a is a constant. If you are already familiar with the exponential function, and know that d dx e ax =a e ax , you can see the equation is solved by the exponential function. Otherwise, the equation can be rearranged to df f =adx, then integrated using ∫ df f =lnf to give lnf( x )=ax+c, with c a constant of integration. Finally, taking the exponential of each side, using e lnf( x ) =f( x ), gives f( x )=C e ax , where C= e c .
1. Atmospheric pressure varies from day to day, but 1 atm is defined as 1.01 x 105 Pa. Calculate how far upwards such a pressure would force a column of water in a “water barometer”. 2. The density of air at room temperature is about 1.29 kg/m3. Use this together with the definition of 1 atm above to find the constant C in the Law of Atmospheres written above. Use your result to estimate the atmospheric pressure on top of the Blue Ridge (say 4000 feet), Snowmass (11,000 feet) and Mount Everest (29,000 feet).